Cellular Sales Comes to Depew, N.Y. This new store makes it more convenient for our Buffalo-area customers, and it gives them more options to find a Cellular Sales close to them. 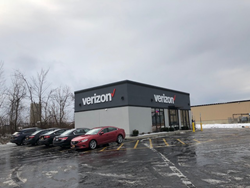 Cellular Sales, the largest independent Verizon Wireless retailer by volume, is increasing its Buffalo-area presence by opening a new store in Depew. The new store is located at 3263 Walden Ave., at the corner of Walden Ave., and Transit Rd. Cellular Sales opened its doors on Dec. 12. Cellular Sales has been named to Inc. Magazine’s Inc. 5000 list as one of the nation’s fastest growing privately owned retailers nine times in the last 10 years. Placing an emphasis on customer service, Cellular Sales has grown from a single store in Knoxville, Tenn., to a national retailer operating 650 stores across 39 states. Cellular Sales seeks to hire motivated sales professionals with a passion for customer service to work at its Depew store. Those interested in applying for jobs at Cellular Sales in Depew may contact Cellular Sales Recruiter Jason Alexander at (615) 788-9634 or jason.alexander(at)cellularsales(dot)com.